This week’s chart series shows that the five largest banks (by assets) in Q4 2014 held 46 percent of US banking assets and 40 percent of domestic deposits. That’s up from 28 percent and 20 percent, respectively, in early Q1 2000. Small banks play a critical role in the US banking system and are particularly important in rural and small metropolitan areas. As an AEI report details, small banks are key providers of certain products, such as small business loans, mortgages, and farm loans. They typically fund themselves with customer deposits. Small banks’ community focus enables them to develop and maintain relationships with customers in a way that large banks without a deep local presence cannot. Through these interactions, they obtain information about borrowers that larger banks generally do not have. As a result, small banks are able to make loans to borrowers who might not qualify under larger institutions’ standardized lending criteria. Since the financial crisis, US banking assets and deposits have continued a long trend of consolidation in a handful of large banks. 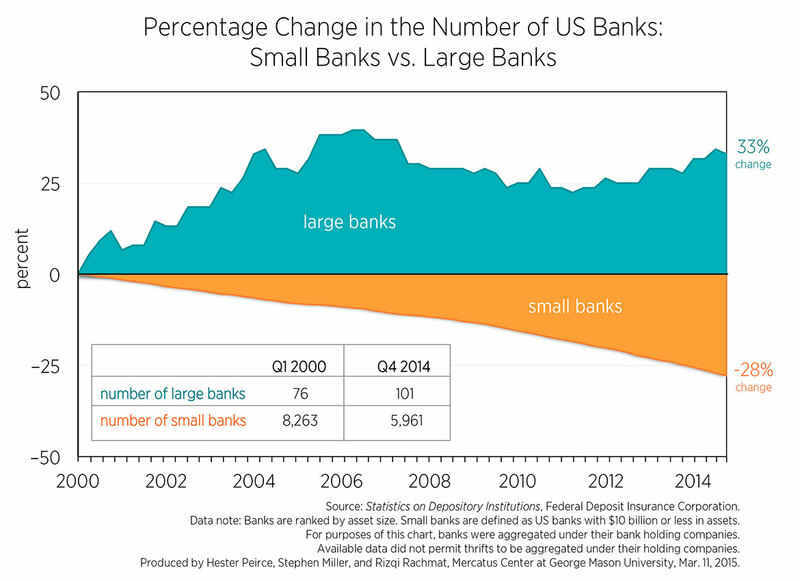 The number of small banks (which we define as banks with $10 billion or less in assets) has declined 27 percent, from 8,263 in Q1 2000 to 5,961 in Q4 2014. Simultaneously, the ranks of large banks have increased 32 percent, from 76 in Q1 2000 to 101 in Q4 2014. This week’s chart series shows that the five largest banks (by assets) in Q4 2014 held 46 percent of US banking assets and 40 percent of domestic deposits. That’s up from 28 percent and 20 percent, respectively, in early Q1 2000. 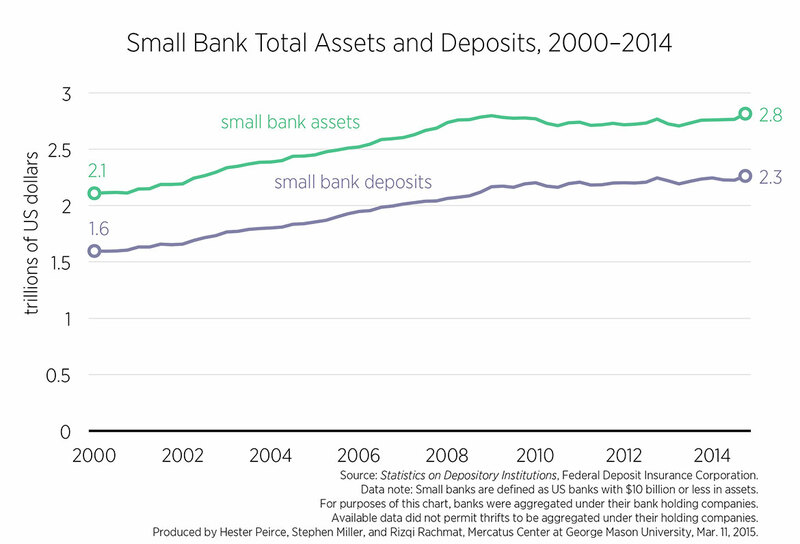 Correspondingly, even though small banks’ assets and deposits have grown since 2000, small banks’ share of domestic deposits has fallen from 40 percent in Q1 2000 to 22 percent in Q4 2014, and their share of US banking assets has declined from 30 to 18 percent. 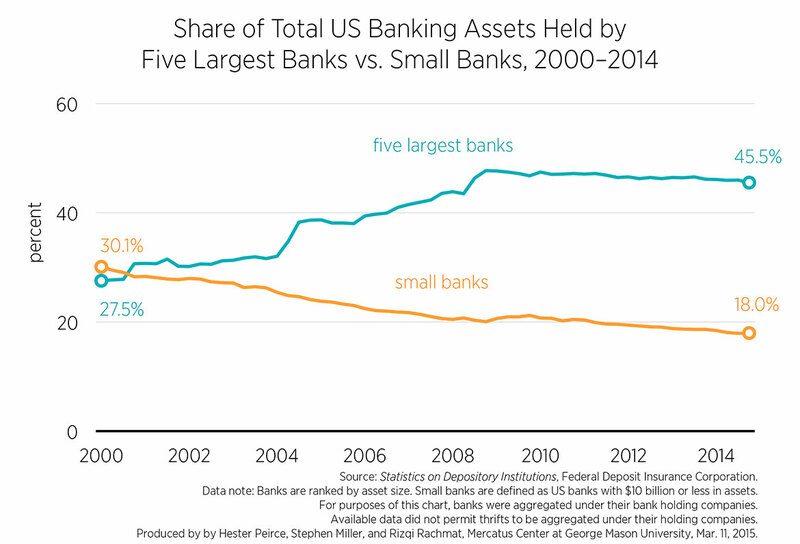 There are many factors at work contributing to the decline in small banks’ market share over the years. Some of the decline is organic. Market forces encourage combinations of small banks as a way of spreading operational costs over a larger customer base. Large banks also can offer a wider variety of services. The FDIC finds that an average of 182 mergers and 107 charter consolidations occurred per year from 2001 to 2011. 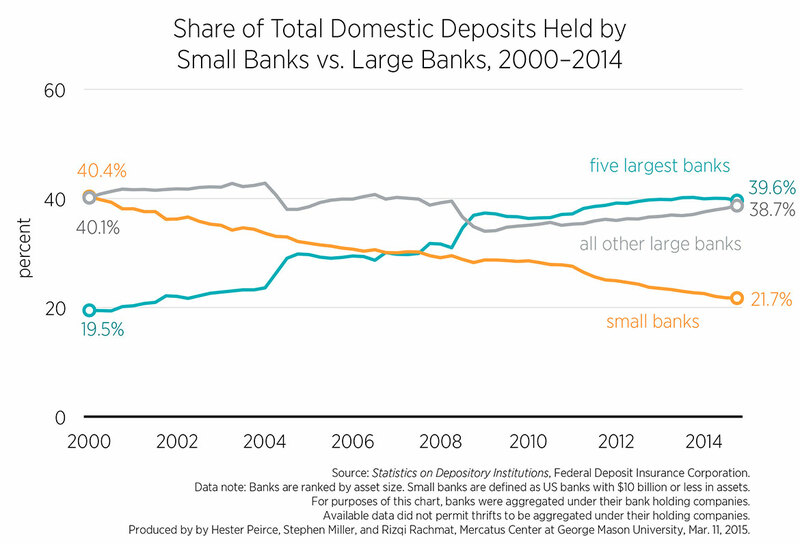 The FDIC also shows that some small banks simply outgrew their small bank status. As a recent Mercatus Center survey shows, Dodd-Frank poses considerable challenges for small banks. While bank concentration itself is not bad, increasing regulatory burdens should not be the driver of regulatory consolidation. Dodd-Frank is costly for large banks, too, but regulatory compliance can be a particular challenge for small banks with limited access to compliance expertise. Regulatory expenses absorb a larger percentage of small banks’ budgets than that of their larger counterparts’ budgets. Although correlation is not evidence of causation, as financial regulation has increased since the financial crisis, so has banking concentration. 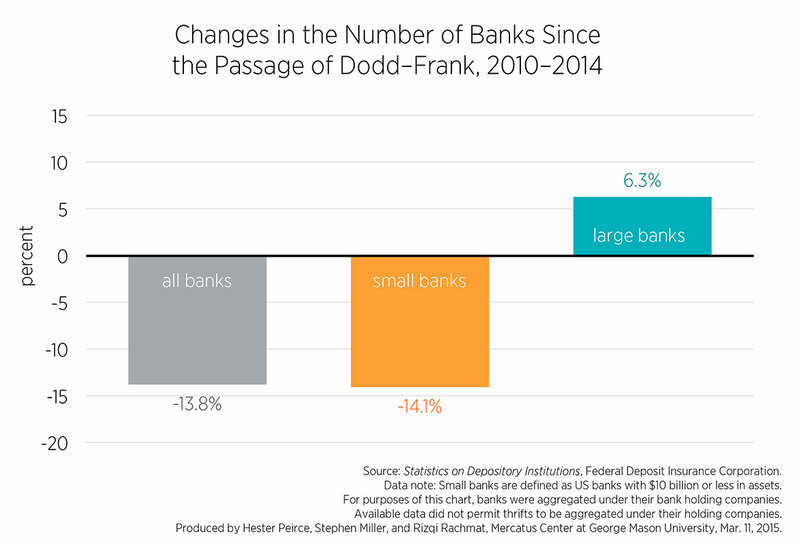 The Dodd-Frank Act, passed in 2010, imposes a new set of regulations that are arguably disproportionately burdensome to small banks, even though many are directed at larger banks. Moreover, by designating the largest financial institutions as “systemically important,” Dodd-Frank creates a market expectation that designated firms are too big to fail, which may generate funding and other competitive advantages for the largest US banks. Since 2Q 2010—immediately before the July passage of Dodd-Frank—to 3Q 2014 (the most recent quarter for which data are available), the United States lost 14 percent of its small banks. Small banks’ share of US domestic deposits and banking assets decreased by 6.5 and 2.7 percentage points, respectively, and the five largest US banks appear to have absorbed much of this market share. 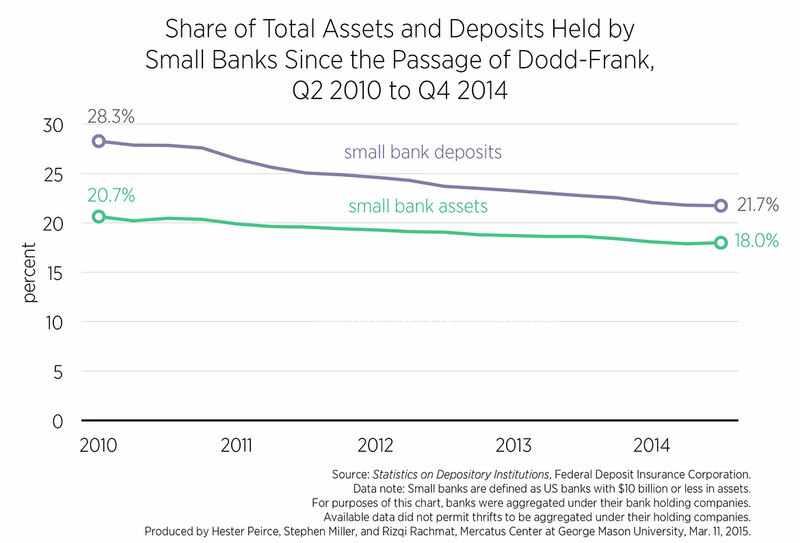 A recent Harvard Kennedy School working paper documents the post-Dodd-Frank decline in small banks’ share of bank assets. To the extent this trend is driven by regulation—not market forces—it is troubling, since small banks are important members of the financial industry and of the local communities they serve.